This Windows XP computer, too, is so slow, buggy, virus-infested, and generally unusable that it takes me forever to post to my blog. If this is what nonprofessionals have to deal with, it's a miracle that Windows users aren't jumping off high buildings all the time. What a disaster. More walking among rice terraces. They have pretty much carved up most of the mountains around Ping'an. Most rice paddies are less than a meter wide. Like the fields, the path follows the contours of the mountain, and is mostly paved with slippery stones. Fog rolls over the hills all the time, sometimes I can't see anything and sometimes a vista opens up, and changes again a few minutes later. At strategic points, local women in colorful dresses and hairdresses, carrying baskets of souvenirs, waylay tourists. But like elsewhere in China so far, they are friendly and never tenacious. Took another local bus to Longsheng. Quite crowded. The first nine kilometers went through Guilin's urban sprawl, no less ugly than downtown Guilin, just highrise concrete boxes that hide the peaks behind them. The scenery improves after Guilin, first rolling hills and soon the road winds its way up to 630m, then back down to 250. There is a burnt smell, and the driver stops and cools his brakes with a water hose; steam rises. At one point the driver looks at me, asks Ping'an?, and when I nod, he stops and I get oiff and catch a bus stopped on the other side of the road. After numerous switchbacks, the new bus reaches the small hill village of Ping'an at 825m. It's a marvellous view - many old ornamented wooden houses cling to the side of the mountain on stilts, with every bit of space used. I am staying at the Countryside Inn, all wood, slightly creaky and unheated (it's fairly cold up here) but very nicely renovated with friendly English-speaking staff. People come here not only for the village, but for the rice terraces. They cling to the side of the mountains, following its contours, just like the village itself. They are huge - dozens and dozens of terraces, usually no wider than one or two meters, and some as narrow as 30cm, separated by artificial walls and an ingenious irrigation system. There are several paths that climb up to over 1000m and allow fantastic views over the endless terraces. Wisps of fog add atmosphere. In the evening, the fog creeps up from the valley until it's difficult to see. Took a local bus to Guilin, the other end of the usual Li River cruises. This town is totally different from Yangshuo - lots of traffic, asphalt, concrete, modern Chinese architecture that is supposed to impress but only manages to depress with its mindless rows of bland office buildings. They have narrow green strips along the rivers that escaped destruction. Maybe Guilin was once a nice town but no more. I went to the Seven Star Scenic Area, a tired park with a few monuments and low peaks. I'll be charitable and post a nice picture from the park. The Internet PCs I am finding on this route become slower, more virus-infested, with broken browser installations. I hope this post makes it. No more pictures. In the morning, I went out on a bicycle and with a guide, David Wong, the manager of the Hongfu Palace Hotel. He speaks English well. It took a while to find a bicycle that was large enough for me. David used an electric scooter because he was afraid that I'd outrun him, and in fact I did a few times because he was faster only uphill on smooth asphalt. First we went to Moon Hill, a peak with a large crescent-shaped hole. I took a minivan ride up to Dragon Cave. The road is terrible and the van shook pitifully. Where other drivers keep car wash coins, he kept a collection of rusty bolts. The cave is huge, with a long convoluted path cut through its many caverns. The first leg is by boat. Later some sections are under water too, with Indiana Jones bridges complete with broken logs (but at least they weren't suspended high up with ropes). The path was only a meter high in some places. My guides pointed out several dozen rock formations with flowery names like "dog rides golden lion". They knew all the places where I should take pictures and wouldn't continue until I did so. They spoke no English at all, and could only point at names on an English/Chinese map. After returning from the cave, we continued by bicycle through the most marvelous scenery, through a valley of farm land, along Yulong River, surrounded by Yangshuo's trademark sugarcone peaks. The road quickly turned into a narrow trail through the fields and small villages, most of which cannot be reached by a regular road. Eventually we reached Jiuxian, a historic village that really looked like it hadn't been touched in centuries. We had excellent steamed fish there, caught the previous evening. The last stop was the Dragon bridge, an ancient stone arch in another old village. But what made this ride so fantastic was the scenery around us, not the monuments. 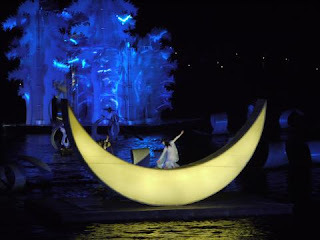 Addendum to Monday's entry: at night I went to the Impressions Liu Sanjie, which is an enormous ballet of 600 actors that uses an entire lake and the mountains behind it. They use floats with little palaces on them that look like snowflakes, long floating platforms spanning the lake, lots of boats, long colored ribbons, and very sophisticated illumination. Dancers seem to walk on water, glitter, change color, while boats with lights were swirling around like fireflies. I had a good seat and got some surprisingly good pictures despite a handheld camera at full 400mm. 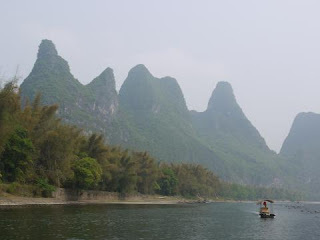 Took a local bus to Yang Di where I had reserved a private boat on the Li River. The boat is made from bamboo and the bamboo is made from plastic. river between the huge overgrown stone pillars, forming a jagged skyline all around us. Some are in sunlight, others recede in the mist. There are few other boats, and when the motor is off, I can hear only the wind, the birds, and the voices of other boatmen echoing off the cliffs. The scenery is so fantastic that it's shown on the 20 Yuan note, and my boatman's cigarette pack; he stopped in both locations to show me. The water level is very low, so there are gravel banks along the shores and in the middle of the river. People have set up tents there and sell food, mostly crawly things with way too many legs on skewers. After reaching the Xing Ping, we took a minibus to the center of this smart little harbor village. I spent some time wandering about before returning to Yangshuo by bus. This was a grand day out! The bus from Guangzhou to Yangshuo takes eight hours, but there is so much to see that it's never boring. All the long-distance buses are reasonably modern and comfortable, and unlike other buses I have used in Asia, quiet (both the engine and due to the absence of soap operas on the TV set). It makes three rest stops. Before one is allowed to enter the bus, the baggage gets x-rayed, as always. At first, the towns we passed through were all well-maintained sterile concrete affairs with wide boulevards with flower beds in the middle, without any sign of the seediness one can find in Guangzhou. A bit like Wolfsburg with flowers. But later on, towns look like Asian towns are supposed to look like - a little run down, busy, alive with merchants and cyclists and animals and shopkeepers going about their trade. The freeway is new, wide, and smooth, except in a few places where construction isn't finished. 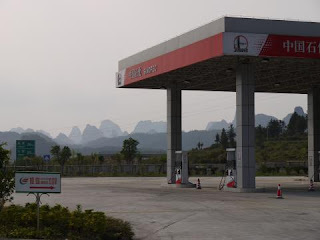 About an hour before reaching Yangshuo, the karst mountains begin. They consist of countless conical pillars of rock that form a violently jagged skyline all around the road. Yangshuo itself is nestled in between of several karst pillars. It's a busy little town that caters mainly to tourists, but manages to preserve its soul. The main street is Xi Jie, or "Western Street" as it confusingly shown on signs even though there is very little English signage in this town. It's a pedestrianized street lined with modern shops and restaurants, in old two-story or houses. It's sort of pleasant despite all the glowing ads and tourists. Virtually all the tourists are Chinese, I saw perhaps a dozen Westerners all evening. My hotel is the Hongfu Palace Hotel. The rooms are a little cheerless despite the wooden floors, stucco, and old furniture, but the building is in is a magnificent 400-year old guild hall. Most of the other hotels are either backpacker hostels or sterile Chinese tourist hotels. And as it's off-season, I haggled the price down to less than half the rack rate with little effort. But, no WLAN.